Gentile da Fabriano (c. 1370 – c. 1427) was an Italian painter known for his participation in the International Gothic style. Gentile was born in or near Fabriano, in the Marche. His mother died some time before 1380 and his father, Niccolò di Giovanni Massi, retired to a monastery in the same year, where he died in 1385. Gentile worked in various places in central Italy, mostly in Tuscany. His best known works are his Adoration of the Magi (1423) and Flight into Egypt. By 1408 Gentile da Fabriano was working in Venice. Between 1409 and 1414 he painted a fresco (now lost) in the Doge's Palace depicting the naval battle between the Venetians and Otto III, before moving west to Brescia. By the 1420s he was working in Florence, where he painted his famous altarpiece depicting the Adoration of the Magi (1423), now in the Uffizi and regarded as one of the masterpieces of the International Gothic style. In 1425 he left Florence for Siena and Orvieto (where he painted his fresco of the Madonna and Child in the Cathedral before arriving in Rome. In Siena, he left a profound influence on Sassetta. He died in 1427 while working on frescoes (since destroyed) in the Basilica of St. John in Lateran. He is commonly said to have been buried in the church now called S. Francesca Romana in Florence, but his tomb vanished; there is evidence, however, that he may be buried in the church of Santa Maria in Trastevere, in Rome, the place of his death. He left no works in the Marche, except possibly a Madonna and Child (of uncertain attribution) in the Duomo at Sant'Angelo in Vado, near Urbino. He also left one painting in Venice. 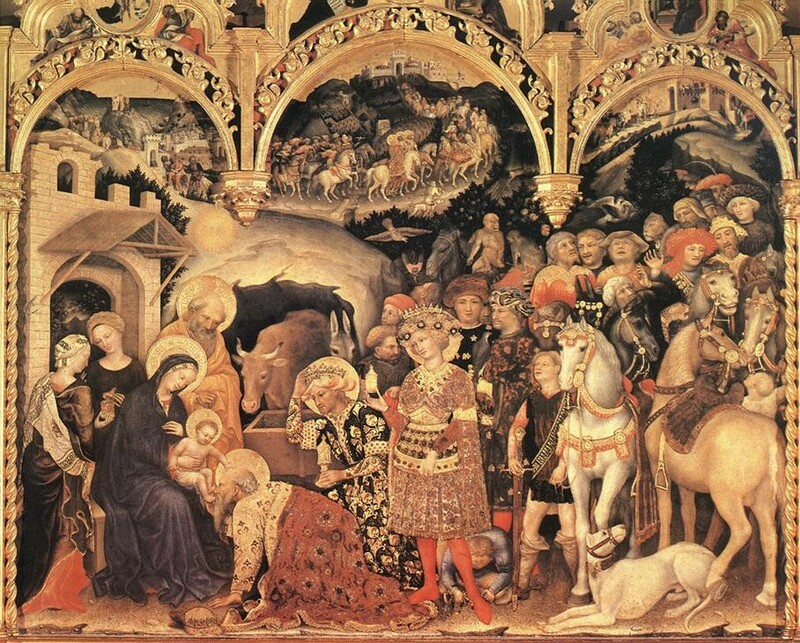 The Adoration of the Magi is housed in the Uffizi Gallery in Florence, Italy, is considered his finest work, and has been described as "the culminating work of International Gothic painting". The painting was commissioned by the Florentine literate and patron of the arts Palla Strozzi, at the arrival of the artist in the city in 1420. Finished three years later, it was placed in the new chapel of the church of Santa Trinita which Lorenzo Ghiberti was executing in these years. The works shows both the international and Sienese schools' influences on Gentile's art, mingled with the Renaissance novelties he knew in Florence. The panel portrays the path of the three Magi, in several scenes which start from the upper left corner (the voyage and the entrance into Bethlehem) and continue clockwise, to the larger meeting with the Virgin and the newborn Jesus which occupies the lowest part of the picture. All the figures wear splendid Renaissance costumes, brocades richly decorated with real gold and precious stones inserted in the panel. Gentile's typical attention for detail is also evident in the exotic animals, such as a leopard, a dromedary, some apes and a lion, as well as the magnificent horses and a hound. The frame is also a work of art, characterized by three cusps with tondoes portraying Christ Blessing (centre) and the Annunciation (with the Archangel Gabriel on the left and the Madonna on the right). The predella has three rectangular paintings with scenes of Jesus' childhood: the Nativity, the Flight into Egypt and the Presentation at the Temple (the latter a copy, the original being in the Louvre in Paris).